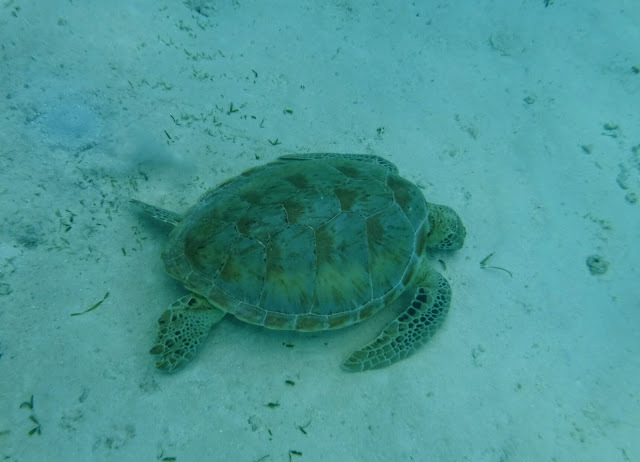 Swimming through clear water, watching the turtles and rays swim below me. The schools of fish flitting among the coral, the small white gobi dart in and out out their holes in the white sand. 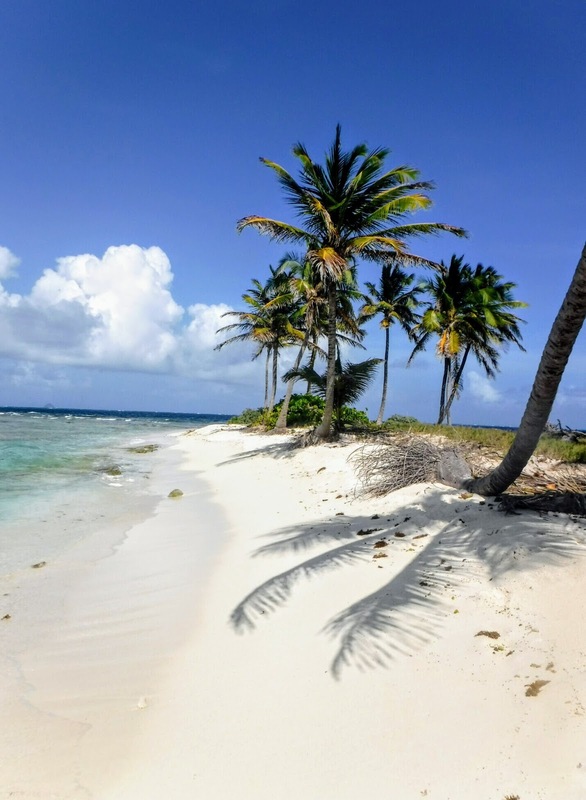 The Tobago Cays are 5 small islands of St. Vincent and the Grenadines, they are Petit Rameau, Petit Bateau, Jamesby, Baradol and Petit Tabac. and have been designated a Marine Park for the last 20 years. This has allowed the fish to grow larger and the turtles more numerous. 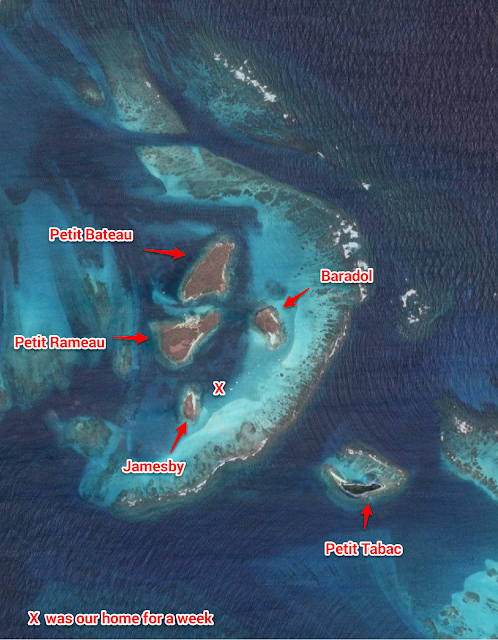 There are no houses and no stores on the 5 small islands. There are boat boys that will come around and sell you fish or banana bread. They will also, for a fee, go to the neighboring islands and fetch other items for you. We spent a week in the Tobago Cays and only left because our food and our water were running low. We watched other boats come and go, staying for 1, 2 or at most 3 days. Our stay there was peaceful, quiet and serene. Because it is a marine park there is minimal boat traffic through the area making it an ideal spot for some distance swimming. 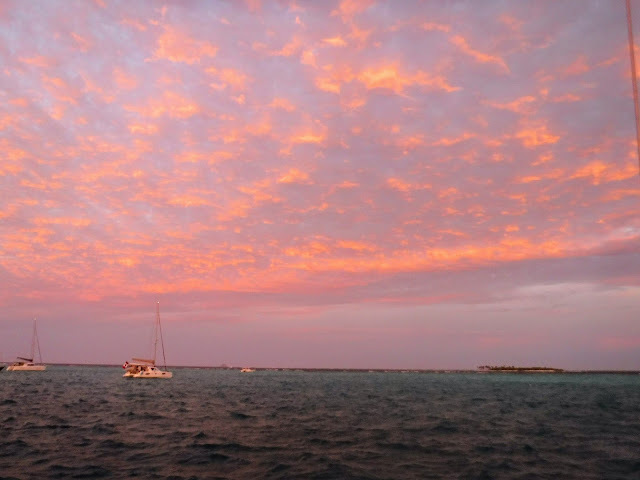 Every morning I would set out from the boat, swim across the sandy bottom towards the coral reefs surrounding the islands. I would get a good workout, and pause to watch the marine life as we passed each other. The Southern stingrays sit on the bottom and vacuum up the sand, snuffeling as they go. They are inevitably followed by smaller fish taking advantage of the food that is disturbed by the rays. Box fish are often following the rays, letting the rays do the work for them, or they will hang out by our anchor chain, waiting for the chain to drag along the sand and dislodge their prey. In the absence of either of these two methods they will clear the sand by themselves, their lips forming a long tube by which they can blow the sands. They will circle around a spot in an ever widening radius forming a perfect circle of dislodged sand. In the afternoons Bob would join me for another swim. We circumnavigate two of the islands (Jamesby and Baradol) and swam between two other island (Petit Rameau and Petit Bateau) with a current that was so strong that we had to swim diagonally to get from one side to the other. You can see the evidence of the current on the map above. We could watch the shadows of the ripples of the current shimmer along the bottom of the channel. 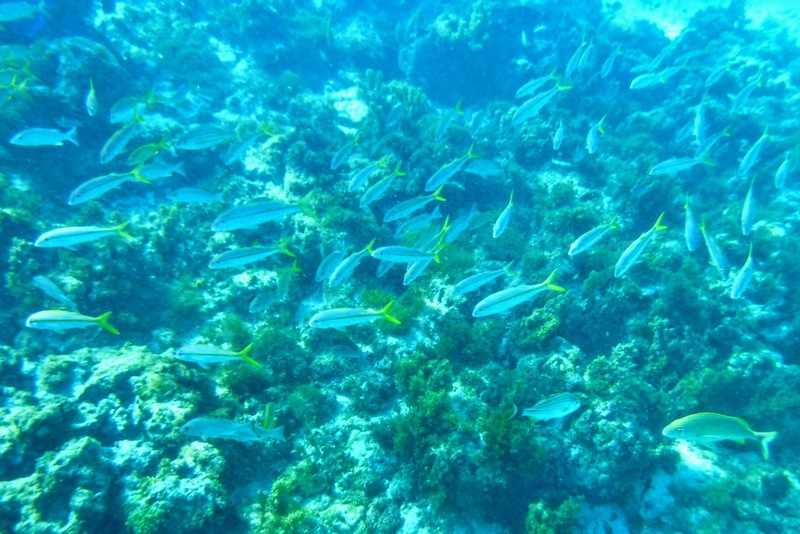 The coral reefs that we discovered on the backsides of the islands were teeming with fish. We would swim for a while and then just drift and watch the fish. Back at the boat we could watch the turtles below us, or the schools of tiny silversides, little fish in very large schools, sometimes surrounding the boat, reflecting the sunshine as they turned to and fro. 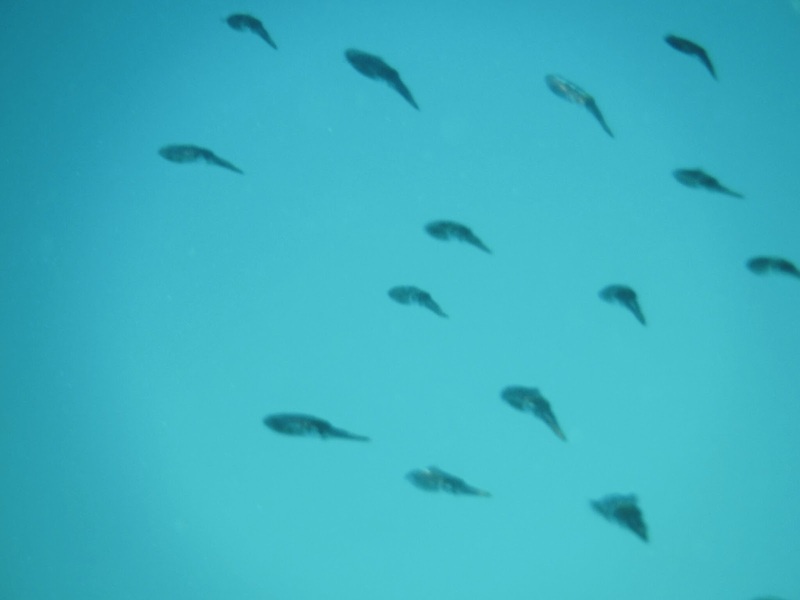 On several occasions we had the joy of watching hundreds of baby Caribbean Reef Squid swimming around the boat, the largest of them were about the size of my little finger. Their little fins constantly undulating and their colors gently shifting. They would move slowly away if we approached them, but if we remained still they would watch us and not move away. 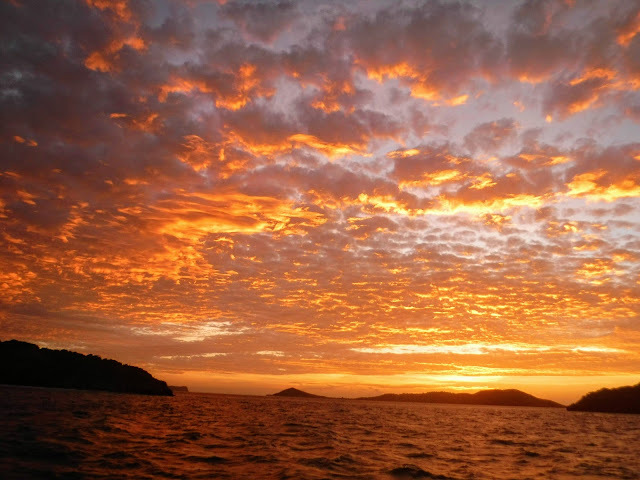 The sunsets at the Tobago Cays were spectacular, illuminating the entire sky. Reds in the west fading to pinks in the east. This is my idea of Paradise. I could spend a long time in a place like this and never grow tired of the views and the marine life. It is certainly on our list of places to return to. Wow! Sounds like a place I would LOVE...I want to be there! It is somewhere that is high on my Favorite Places list!